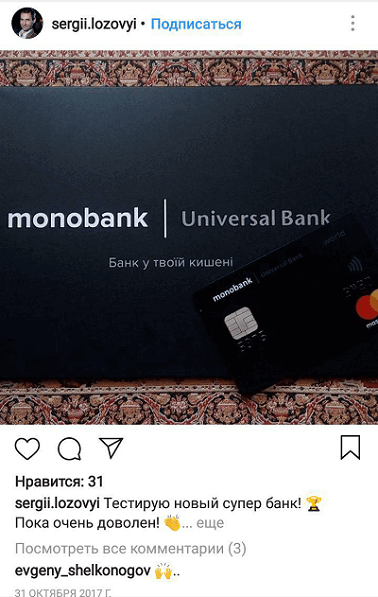 Monobank is the first mobile branchless Bank in Ukraine: all banking services are processed through the application only. 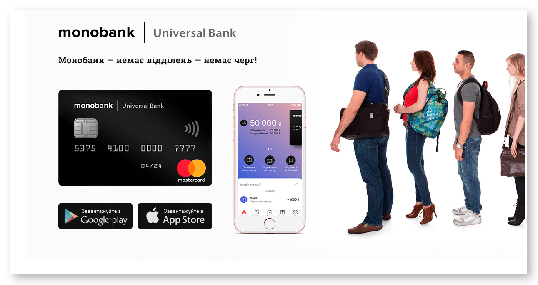 The project was created in the cooperation of Universal Bank and Fintech Band. Monobank is an innovative service in the Ukrainian market. As people are used to using services from large nationwide banks with branches, this was a challenge to assure clients that this new banking app is a safe product and service, convenient and advantageous solution. Our team came up with the idea to follow the well-known marketing model of consumer behaviour ‘AIDA’ while promoting Monobank. This matched our case perfectly as the product was unfamiliar to the audience and the long-run objective was to gain loyal clients. For each stage, our team has elaborated the most relevant approaches according to the particular goals. When we started our cooperation, the Monobank app was at the development stage. Our team decided to announce the upcoming product both via social media networks and Google display network. 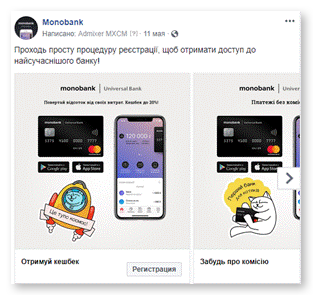 On Facebook, we promoted the posts which quoted the Monobank founders. These described the advantages and features of the service, as well as revealed some creative workflow insights. Simultaneously, we created a set of display ads and launched Facebook and Instagram PPC campaigns targeted at entrepreneurs and users who prefer online shopping. A PPC campaign as well aimed at the landing page was concurrently performed on the Google Display Network. 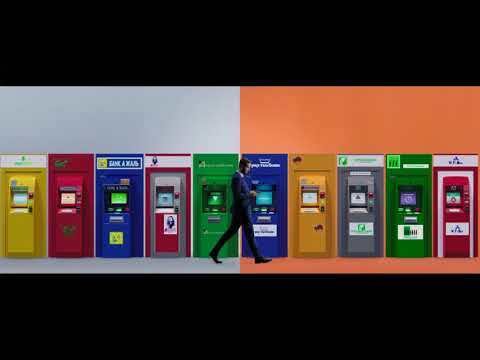 These ads depicted in various formats including animation banner. 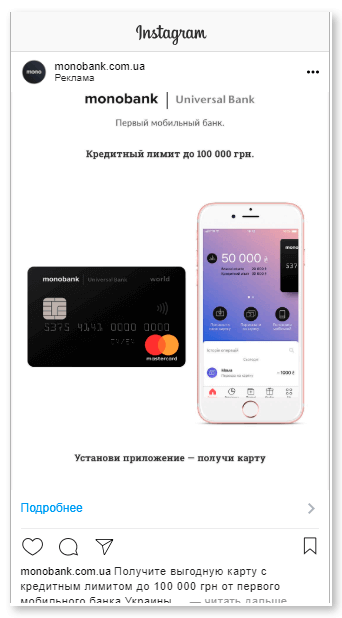 Before the app became available in the relevant app stores, Monobank decided to test its beta version within users who had shared their email addresses on the landing page. A focal group received the app with a tutorial on how to download it to a smartphone, and after a while, each of the participants obtained a card. 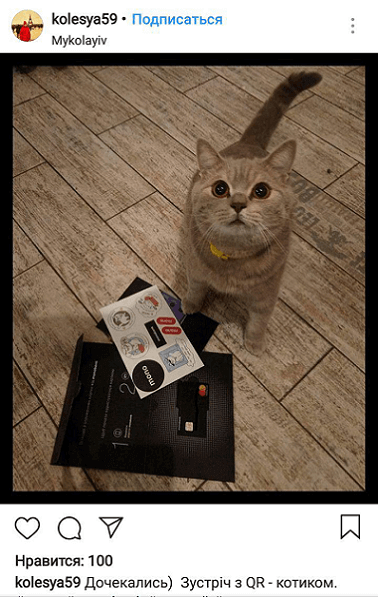 As a minimalistic card was complemented with a sticker pack featuring cute cats, people began to publish their impressions on different media networks. This real feedback attracted new clients and heightened the interest in Monobank. 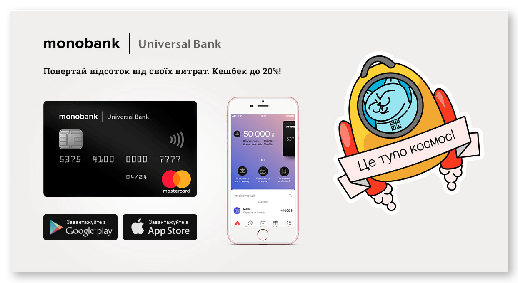 The Monobank app released on the App Store and Google Play in November 2017. To rank higher within these app stores results, our project team performed app store optimisation (ASO) optimising the target app’s keywords before the launch. The campaigns aimed at pre-orders were still active. 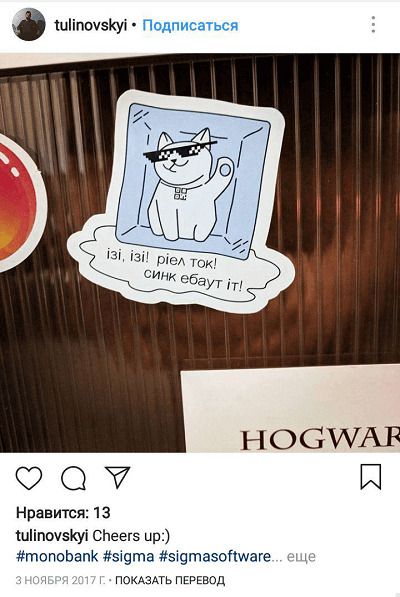 However, to convert interested users into clients we launched CPI campaigns aimed at app installs on Google Ads, Facebook, Instagram, and Twitter. The video ad campaigns aimed at the landing page had been performing from December to mid-January 2018. 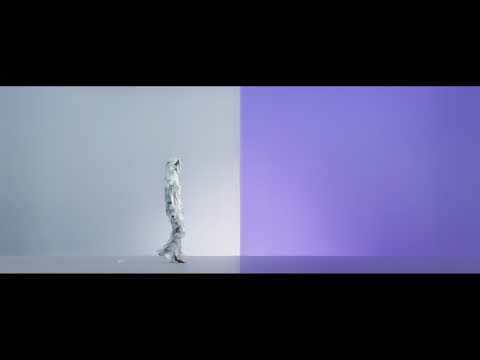 Later, these videos were used in the campaigns aimed at the app installing. 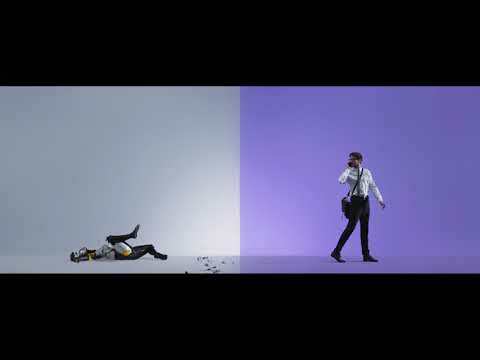 Realising that the winter holidays were coming, and people were going to purchase gifts online, our team launched a ‘buzz’ campaign with short videos featuring why Monobank is better than other banks in Ukraine. These were performed within the AdWords campaign, as well as on Facebook and Instagram. 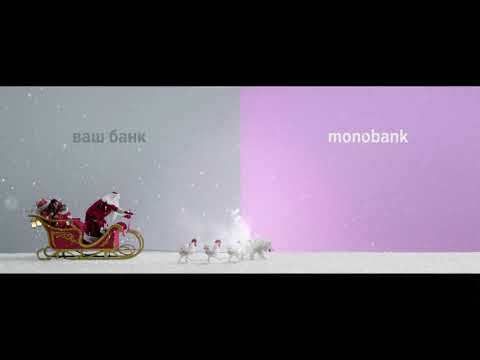 Before the winter holidays, we launched campaigns with short videos featuring why Monobank is better than other banks in Ukraine. These were performed within the AdWords campaign, as well as on Facebook and Instagram. Video ads received more than 2M views for the period from December to January. The campaign didn’t boost the numbers of installs, but engaged a broader audience and increased brand loyalty. 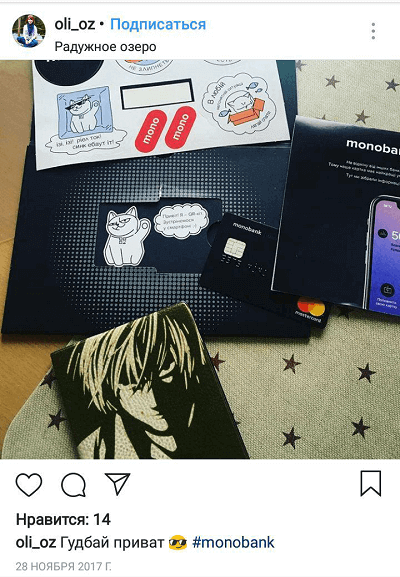 In January, when we had put out feelers to see which creative solutions attracted our target audience the most, we reviewed our CPI ads and launched the CPA campaign only with those banners which featured Monobank cat stickers. As these brand symbols became recognisable among users. The campaign was aimed at the landing page and was shown for brand queries and broad queries such as order a credit card. 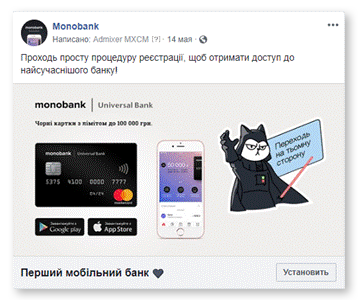 In January, we reviewed our CPI ads and launched the CPA campaign only with those banners which featured Monobank cat stickers. The campaign was aimed at the landing page and was shown for brand queries and broad queries such as order a credit card. We decided to reinforce the engagement and launched several types of remarketing campaigns which performed on Facebook, Instagram. • Remarketing to users who visited the landing page, but have not installed the app. 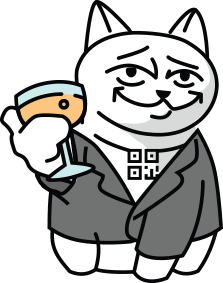 • Remarketing to users who installed the app, but have not confirmed a phone number (within 1 day, as well as within 3 days). 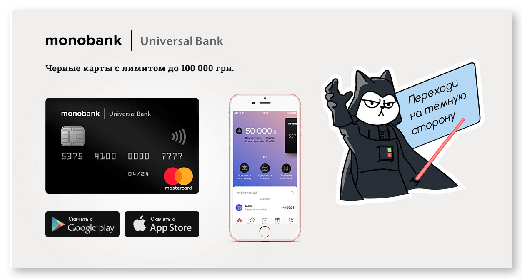 • Remarketing to users who installed the app, but have not activated the card (within 10/30/180 days). 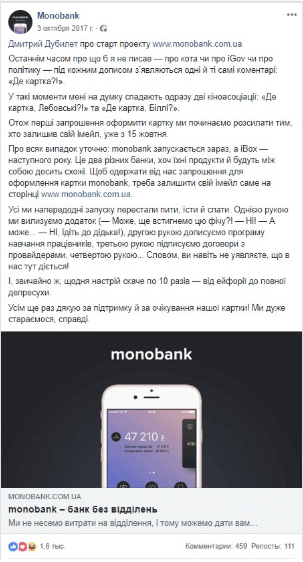 Our team decided to promote one of the advantages of Monobank’s services – on-lending. 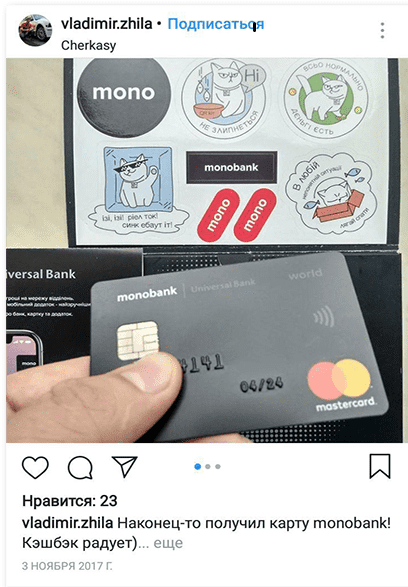 In this way, users could pay back a loan which they had arranged with another bank with the new Monobank card. We launched campaigns on GDN, Facebook and Instagram for a month. These were shown for such keywords as refunding, credit repayment and so on, and targeted to the audience of users who enjoy credit facilities. According to the pessimistic forecasts, 45 thousand Monobank cards should have been issued by April 2018. In fact, that aim was reached by January 1, 2018. As we connected further marketing tools, the number of application installations keep growing. By early September 2018, the Bank’s customer base had increased to 400,000 clients. 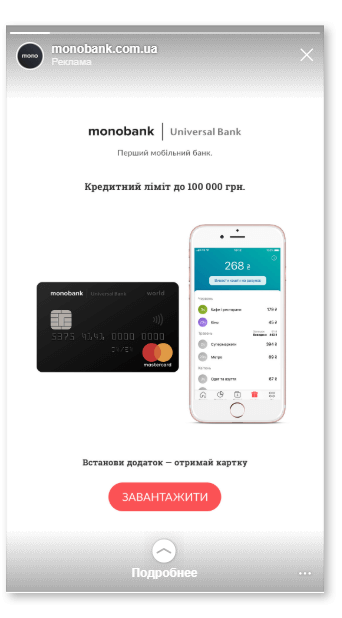 Monobank became the first mobile Bank in Ukraine and the main Fintech-startup of 2017.